All the buddhas of the past attained Buddhahood because they could take on the sufferings of others and send them well- being and happiness. If one cannot give rise to bodhicitta, even if one engages in the profound dharmas, one is not going to attain Buddhahood. 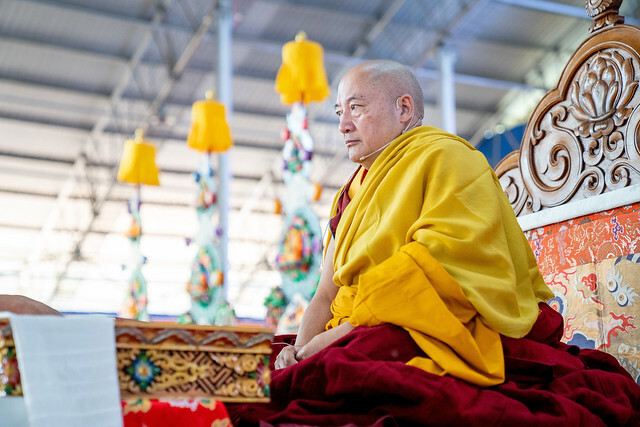 Atisha’s renowned Seven Points of Mind Training, transmitted into the Kagyu lineage through Gampopa, is a summary of seven essential practices on the path of the bodhisattva. The second point is the actual practice of meditation on relative bodhicitta, called taking and sending. The Goshir Gyaltsapa explained clearly the stages of this practice, which forms the foundation of the Mahayana. First we need to understand that there is no sentient being who has not been our mother, our son or daughter. They have all been extremely kind to us at one point or another. For example, even if we try to count how many times one sentient being has been our mother, it is endless. All sentient beings have been our mothers but it’s difficult to recall their kindness. These key instructions habituate our minds to it. We begin by thinking about our mother in this life. Visualize her and reflect on the kindness she has shown us. We were conceived in her womb; our body was formed by taking the essence of her body to develop our own. Our eyes, ears, tongue, arms, and legs developed by extracting her essence. Her life force was taken from her, weakening her body, to nurture us with her body. Further, she experienced a lot of pain at birth. Once we were born, she had to look after us 24 hours a day. She didn’t have time to eat her own food or take care of herself. If we can remember our mother’s kindness in this way, compassion will grow and we will be able to think of other humans, or animals who have been kind to us. In this way we become habituated to the mind of compassion and we can extend it to all beings on planet earth, increasing our compassion even more. Then extend the reflection further. Think of the beings we don’t see – certain animals, pretas, hell beings. Most of the beings who have been our mothers in the past are said to be residing in the hells and their sufferings are so great we cannot even imagine what they are. When you develop compassion to that extent, then meditate on beings you don’t like, those who have harmed you. Extend your reflection to enemies. They have also been our mothers in the past, and they are experiencing the same suffering. We must do everything we can to remove their suffering and establish them in happiness. We need to increase our fortitude, our strength of mind, and continue this meditation until compassion really happens. The suffering we experience here in the human realm is hardly anything at all, said Rinpoche. It cannot be compared to the hells. Illness and death are the main sources of our suffering but even when we are ill, it’s hardly suffering compared to the hells. And when we die we lie on a nice bed with good conditions around us. The root of all of this suffering is the afflictions, ever present in our mind ready to harm us. Attachment, aversion, and ignorance are the causes of the lower realms. Although we are not in the lower realms, we have the seeds within our being. As humans we’re on the edge of a steep cliff ready to fall should we be overcome by them. We have to be careful. We have already given rise to bodhicitta, the wish to do everything we can to establish all beings in happiness. Now we have to develop it, to make our minds strong and become familiar with these teachings on mind training. The next stage is to develop the wish to take on the suffering ourselves and to give our happiness to all beings. We have to alternate between these two thoughts. We do the meditation by joining it with our breath. Imagine the suffering of all beings and its causes. All this suffering enters our body in the form of a very dark light. Think that all beings are freed from their suffering and its causes. When one is breathing out one imagines the white of the moon is exhaled through our nostrils striking each and every sentient being. Every being experiences our merit, our happiness, our qualities and its causes equally until they attain Buddhahood. Imagine it has actually happened and feel their great joy. Do this repeatedly. We can join the visualization with the recitation of the mani mantra. Working in this way will amass the accumulations. Through this practice we can work with the six perfections – patience, generosity, diligence- all are included. The ultimate fruit is the state of complete and perfect Buddhahood. Everything a Buddha does benefits others. Every breath the Buddha takes is of benefit to sentient beings. Every step, every breath. We can develop the wish that each of our actions will help sentient beings. The cause is the practice of sending and taking with the breath. This is how we work with the practice in terms of the session. The Mahayana has a way to work with these objects and poisons, to turn these three kinds of objects into virtue. This is spelled out clearly in the mind training instructions. The words are easy to understand. We experience a beautiful object, desire arises. Reflect on others. This affliction is a cause for taking birth in the lower realms. Understanding that all beings have this cause, we think ‘Ah, this is not good’. So we make the wish: may all these afflictions be gathered into me and may they be freed from attachment. Then we wish that virtuous states of mind arise in them. When one is free from attachment, it’s easy to engage in generosity, and maintain ethical conduct and so forth. Similarly, with anger. We reflect that all beings have been my mothers and will be reborn in the hells. We make the wish, may all beings be freed from anger and may all their anger dissolve into me and be subsumed into the anger I’m experiencing. Then freed from aversion, virtuous states can arise, especially the perfection of patience. May they attain this. Ignorance is the root of the other two afflictions. It’s pervasive. We wish all beings to be freed from this ignorance and may their ignorance be absorbed into me. Having done this, the perfection of wisdom arises in their mind. In this way, our many misdeeds can be purified.